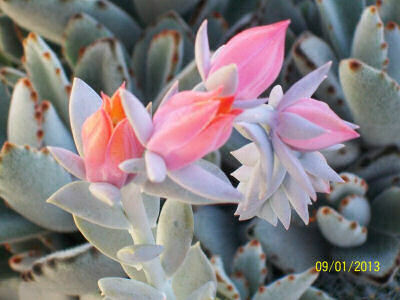 The flowering of Sedum echeveria is a sight to behold. 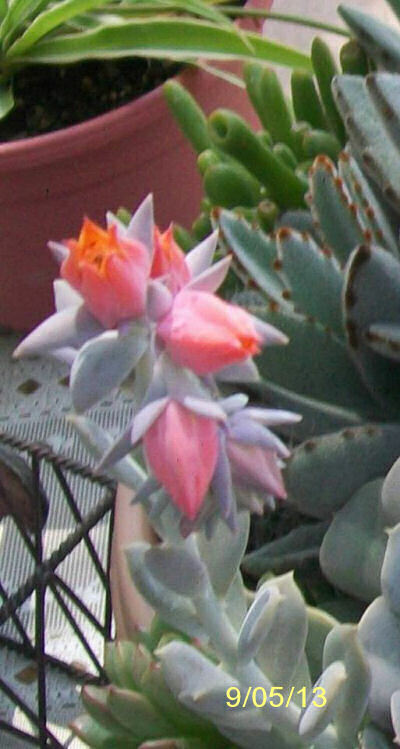 This drought tolerant echeveria has the most spectacular flowers that last for weeks. I often ask the fans of The Gardening Cook on Facebook to share their gardening photos. 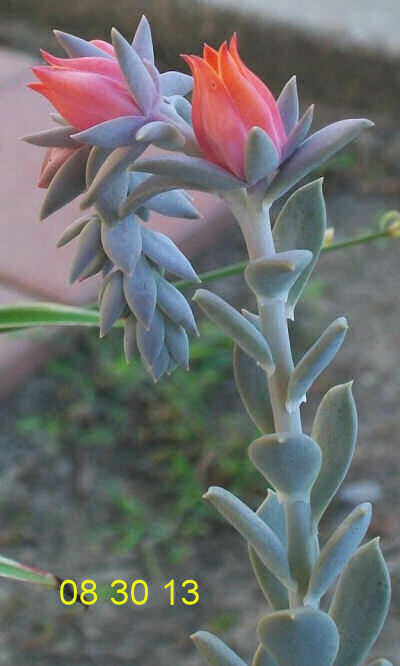 One fan who has often shared with us, Diamond Victoria, has a delightful echeveria about to flower and has shared some photos showing the time line as the flowers are growing. Light. Succulents like a lot of sunlight. Place them in a sunny window if you grow them inside. Outdoors they can take full sun for much of the day. Drainage. Be sure the soil drains well. A succulent mix is recommended. Succulents do not like wet feet and will rot if the soil is too moist. Watering Needs. Water during the spring and summer during the growing season, letting the soil dry out slightly between watering. During the fall and winter, water very sparingly. Propagation. 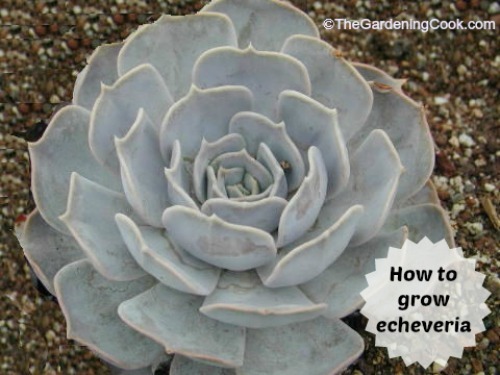 Most echeveria can be rooted very easily from leaf cuttings. To do this, just place an individual leaf in a succulent or cacti mix and cover until the new plant sprouts. Potential problems. Try to keep water off the rosettes as this can cause rot. Also remove dead growth from the bottom of the plant as this can harbor pest if not cleaned out. Re-potting. Re-pot, if needed, in the spring. Do so when the soil is fairly dry. If you notice any dead or rotting roots, remove these. Leave the re-potted plant a bit dry for a few weeks and then resume normal watering schedule. The above photo is a collage of the timeline for the flowers that I made to showcase the wonderful display. Diamond has been very excited to watch it unfold and I am joining her in the excitement each step of the way. The flowers are just stunning. Another view from August 30th. 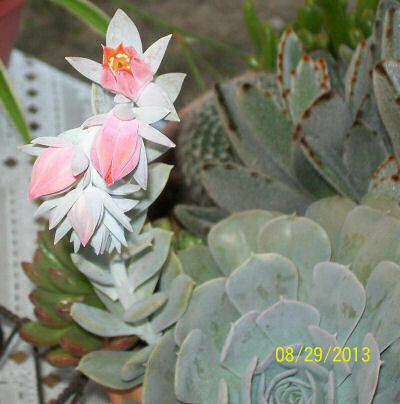 And thank you, Diamond for sharing such a special time line of photos of this delightful Echeveria. 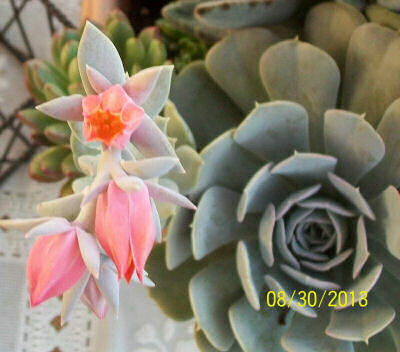 Another echeveria with really dramatic flowers is called “Neon Breakers.) The stems of the flowers can grow to two feet long. 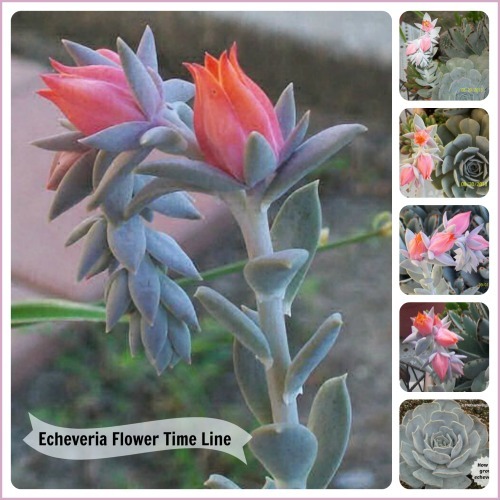 See my tips for growing Echeveria Neon Breakers here. Is there a trick to getting them to bloom like a Christmas cactus? What time of year do they bloom? Mine is outside with little or no sun. Will it bloom anyway? Ty. this was a project that one of the readers of my facebook page did and shared with me. It is flowering now (september). My experience with both cacti and succulents is that it is really hit or miss whether they flower and they have to have JUST the right conditions or you won’t get them to do so. Little or no sun is your problem though. Cacti and succulents are desert plants by nature and need a lot of sun to do well. Very unlikely to flower without it. Where can I get these or can I get a start from someone? I’m out in the country, lots of miles from the nearest store where I might find these. Here is Raleigh, Lowe’s and Home depot both carry them. They are available online from many places. I can’t vouch for them since I have not purchased here, but this place has a big range of them.